my cycling challenges.... : Day 7 : Aviemore to Pitlochry : 52 miles, overcast and threatening rain more than the 30mins I got! 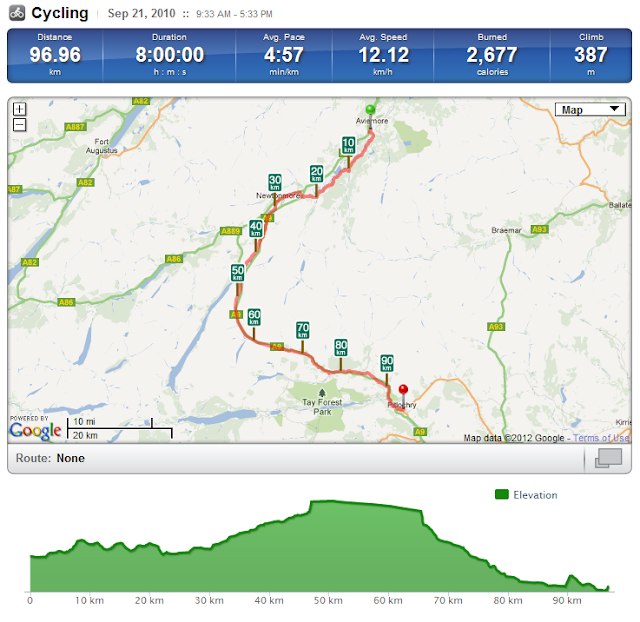 Day 7 : Aviemore to Pitlochry : 52 miles, overcast and threatening rain more than the 30mins I got! My route south of Aviemore continued to follow the NCN7 away from the A9(T). Initially the autumn colours in the deciduous forests with fast running streams passing under the road gave a quite enchanting feel to the place. Everything opened up a bit more as I steadily climbed passing along the Spey Valley, past the outdoor pursuits centre on Loch Insch and on passed the Hannovarian's Ruthven Barracks near Kinguisse. During the 18th century after the 1715 Jacobite Uprisings the British Government decided to tighten its grip on the Scottish Highlands by building four fortified barracks in strategic locations. Ruthven Barracks was the smallest but best preserved of them. All of the remains of the earlier castles were removed to make way for this structure. The barracks were completed in 1721. The valley floor from Newtonmore is open and quite barren and it is bit of a surprise to come across the Dalwhinnie Distillery looming so large in such a wilderness. Why is it situated in this windswept spot is that it was close to the geographic centre of the Highlands and so enjoyed easy access to the reliable link to market offered by the new Highland Railway. This helped the distillery to survive its often fragile beginnings, just as surely as Dalwhinnie's setting had earlier helped the village itself to gain an importance beyond its size.The Gaelic word from which the name Dalwhinnie comes is Dail-coinneeamh, also spelt Dail-Chuinnidh, which translates as "plain of meetings." Here on these high windswept pastures between the Grampian and Monadhliath mountain ranges, 18th Century cattle drovers would pause on their journey south, over the Drumochter pass to the great trysts or cattle markets of Crieff and Falkirk. Needless to say, I didn't stop to have a dram or two as I was concerned about getting through the 30km or so over the top of the Drumochter Pass. Drumuachdar pass - highest point on the rail network. I presume this is another spelling of Drumochter. Looking westwards towards Loch Garry. Coming back into civilisation and out of the wind, the route was all downhill bar a short climb out of Killiecrankie into Pitlochry. I enjoyed a delicious plate of neeps, tatties together with a chicken stuffed with haggis and a pepper sauce! Your dinner sounded quite tasty; but I'm not sure the picture adds anything!! Yes I guess Druimuachdar is the gaelic.